It was a dark and stormy night, the clouds tossing out more rain than they had all year. Several days prior, amidst sun and the end of the harvest, word came down that three barrels of premium grape juice were sitting in a house where a New Zealander had been staying and working on some garage wine. Off we went with a ragtag band of young winemakers. Upon arrival, they opened the barrels and we tasted one of the most disgusting things to ever cross our lips. The fermentation had stopped and the wine was stuck in a sweet quasi-wine state. One of this rebellious wine gang members had been working to try and restart it, but as of that evening, their efforts had yet to pay off. Such is life for those in Capçanes. This compact village on a hill in the Priorat comarca of Catalonia is just a bit under 500 people in population so there isn’t much of a scene outside of wine as it sits squarely in the DO Montsant. While many in this village type of situation might turn to garage bands or worse, many of those who work in the large Celler Capçanes have taken to making their own garage wine. 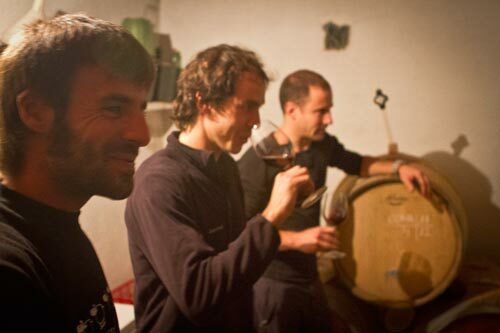 This group of Antoni, Cesc and Jordi (left to right in the picture) were some of the latest to try their hand at their own brand. With stooped shoulders, we all walked out of the old house and left the probably hopeless vinegary grape juice to go back to their cellar where they were working on their own wine, Coma. In Catalan, the name means both a valley amongst the mountains (as there are many in Priorat), as well as “comma”, not the unconscious state received after drinking too much wine. This is a successful venture (albeit still a very small one) they’ve been bottling for a couple of vintages, trying out different labels as you can see below. They’re still running a seat-of-the-pants type of operation scraping up barrels, space, corks, and equipment wherever they can. But, they make it work quite well. Coma 2009 was their first wine and it’s heads and shoulders above any other first wine we’ve tasted. That said, it’s quite large and concentrated in the nose and body when first opened. Not a surprise with 15.5% alcohol. As it breathes, it develops some walnut aromas as well as neutral acidity. The problem it has is that each barrel component steps on one other a bit, taking away from the character. Even still, they’ve done a surprisingly good job of letting the high quality grapes speak for a first vintage. Coma 2010 shows off a complex nose of violet and graphite elements. The body opens with a somewhat large acidity, but the body comes up to balance it with solid berry elements. While similar in nature to the 2009, it feels much better integrated and more refined. Obviously with 15% alcohol, the body is potent, but it mellows faster and presents a more balanced bottle than the previous year. We also tasted the 2011 from the barrels. Using three different types of French barrels, they’re creating three distinct flavors for the wine which, when blended are showing a good deal of promise. They were going to bottle it last week as a young wine but as they realized it wasn’t a favorable day according to the lunar cycle, and apparently it’s also not good to bottle when it rains, this vintage will apparently be bottled in the coming days.